Around 2 lakh plastic bottles collected by NGOs in Mumbai were recycled and fashioned into world’s largest t-shirt. Two lakh plastic bottles, thousands of artisans from all over the country and a time frame of 45 days led India, one of the biggest plastic polluters of the world, to set a Guinness World Record. The apex body of plastic industry in India, Plastindia foundation churned out the world’s largest T-shirt measuring 96.86 metres in height and 69.77 metres in width , using recycled plastic waste – polyethylene terephthalate (PET) bottles with an aim to put across a strong message highlighting plastic pollution. Lakhs of bottles were first shredded to small plastic flakes which were then converted into small pellets. The pellets were melted, spun into yarn and finally stitched into a gigantic t-shirt. To mark Plastindia Foundation’s initiative of reusing lakhs of plastic bottles, an event was held at the Goregaon Sports Club in Mumbai on January 5. It took 3 days and more than 120 people to lay the 2,600 kilogramt-shirt to be laid down for display. 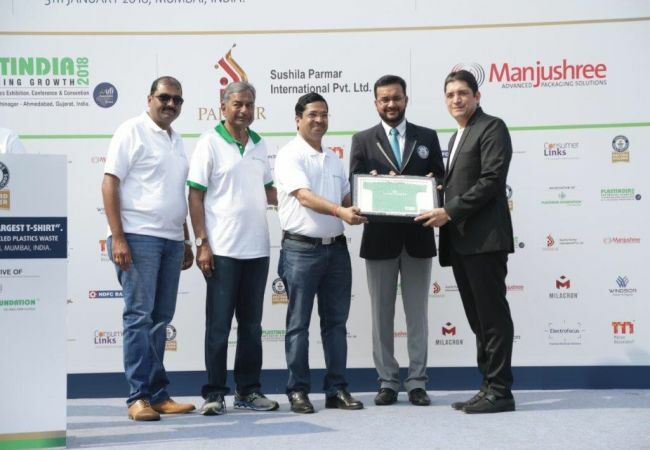 Swapnil Dangirikar, the adjudicator of Guinness World Records officially announced the new record and presented the accolade to the foundation. “The t-shirt made out of 2 lakh plastic bottles is bigger than the current record holder t-shirt which is 93.2 metres height x 62.73 metres width,” he said. 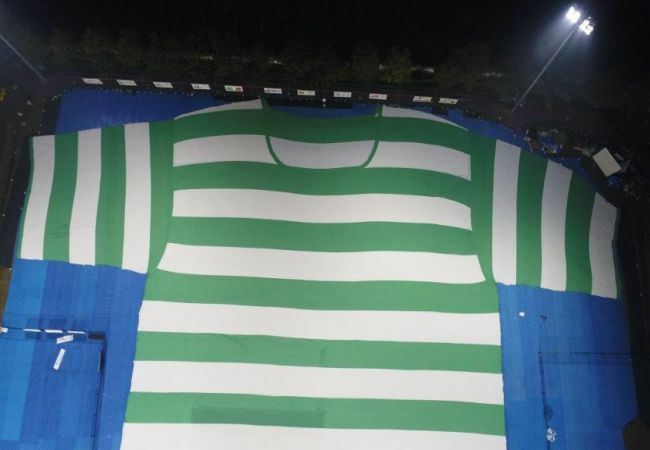 The T-shirt will be dismantled later and the fabric will be re-used to make 10,000 t-shirts. These t-shirts will then be distributed to children from economically backward societies for free. Speaking at the press conference, Atul Kanuga, chairman of the environment and plastic image committee, Plastindia Foundation said that waste segregation can help India reduce its garbage and the t-shirt project is an example. This was possible only because people took an effort to keep PET bottles aside he said. The presence of plastic items in our lives is enormous. Every material has a touch of plastic and hence the disposal is a huge challenge. This initiative is a big step towards educating people that articles can be made out of used plastics, they can be reused and recycled. KK Seksaria, president, Plastindia Foundation also voiced the same views and said that citizens must stop treating discarded or used plastic as waste, instead it should be viewed as a resourceful material. He appealed everyone to keep aside their plastic waste and hand it over to recyclers or reuse it. Previous Post: ‘Rent-A-Cutlery’: Solution To Plastic Cutleries. Next Post: Is CHUK Range The Solution To Plasticware?